Tickets will be available November 1st! 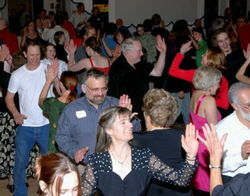 The Joyful Ballroom is located at 3695 W. 72nd Avenue, Westminster, 80030. There is plenty of free parking behind the Ballroom next to the Post Office. The Joyfull Ballroom is wheel-chair accessible. Please don’t forget to bring a potluck dessert or snack to share. ⇒ No stirring about the house! Kitchen facilities here are very limited. No slicing, dicing, tossing, saucing, mixing or fixing. Please bring a treat that’s ready to eat!